Put "About your Music" in the subject line or the Email will be deleted. If you liked the old 50's or 60's rock combo that played at your wedding or at your Saturday night after hours club in the 50's and 60's, then this is the place to hear it again. These are some of my favorite songs Composed by other people. I have sequenced some to sound a lot different than the originals to make them more interesting without the vocal, in some cases in very different styles and arrangements. I also tried to maintain the sound of an amateur 50's rock "n" roll band. Some of these songs may not be as good as the originals without voice, but some may even be better. Just listen and let me know what you think. All of the songs on this site have been sequenced by me, but are the copyright of the original comoposers. My BIO Page and how this music was sequenced along with pictures of me now and my equipment. A Sample of the kind of music you'll hear on my sites! Go to my Home Page to get links to all my sites. This Page is dedicated to my old 50's Rock Combo -The Countdowns. Most of the songs here are from the 50's and early 60's. I am Sequencing them to simulate the way we played in the old days, but with new effects that can only be achieved through computer. Now with the aid of MIDI - I can do what couldn't be done in the past with a hard headed Drummer and my lack of experience at that time. Today I can do what I couldn't do 45 or 55 years ago, play with the tightest group possible -"one person". I can do it only because I was there and know what it sounded like. Good luck to all the guys where ever you are. --- Frank D.
The Countdowns : Denny : Al : Bob : Fran : Me. 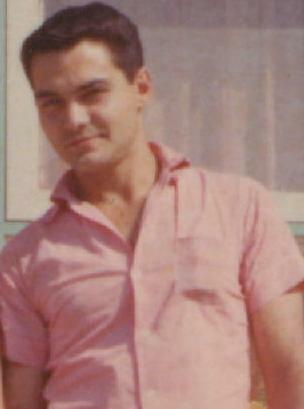 Me in 1960 While a member of the Countdowns. Proof that men did wear pink in those days. 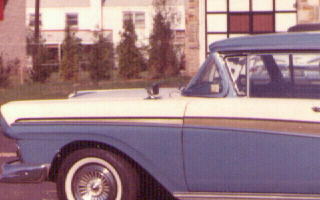 My Car at the time. This Rock n Roll Ring site is owned by Frank P. DiGiovannangelo . Want to join the Rock n Roll Ring? Join the fight to keep this music free for all to enjoy.